The Bush Adminstration at Point Reyes Part II: Whatever happened to the Citizens Advisory Commission to the GGNRA & Point Reyes National Seashore? After three decades of generally good relations between West Marin residents and the Point Reyes National Seashore, how did we end up with a park administration better suited to an autocracy than a democracy? Why does the general public now have only a perfunctory say when major park policies are set? Frankly, the answer is politics, both Republican and Democratic. Back in the 1970s, when the former program for managing the exotic-deer herds through culling was established, the public debated the alternatives, experts of various points of view spoke, and a consensus was reached to maintain the herds at 350 each. And where did all this happen? In public sessions of the Citizens Advisory Commission to the Golden Gate National Recreation Area and Point Reyes National Seashore. Recognizing that the National Seashore and GGNRA were established to serve an urban population, Congress provided for local governments around the Bay Area to nominate most members of the commission, who then were appointed by the US Secretary of the Interior. The commission required Congressional reauthorization every few years, and for almost three decades, Congress approved it. However, in 2002, its term expired, and with Republicans in charge of Congress and the White House, the commission was allowed to die. 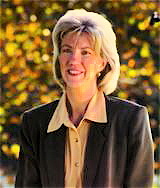 “This time [then-Interior Secretary] Gale Norton (at right) and the Park Service said, ‘It’s been a very good commission for 29 years, but we don’t need it anymore,’” noted former Commissioner Amy Meyer in an interview I conducted for Marinwatch. Meyer of San Francisco and Ed Wayburn spearheaded creation of the GGNRA during the Nixon Administration and served throughout the commission’s existence, along with Richard Bartke of El Cerrito, representative of the Association of Bay Area Governments. National Seashore Supt. Don Neubacher, however, did not want one. As park spokesman John Dell’Osso acknowledged to me in 2004, the park administration had found the commission sometimes interfering with what park staff felt should be done. The Neubacher administration has further argued that local residents don’t speak for all Americans. It’s a specious argument since most park visitors are from the nine-county Bay Area and because people here are far more familiar with the park than people in other parts of the country, who typically know little or nothing about it. Congresswoman Lynn Woolsey (at right), who represents West Marin, did introduce legislation to resurrect the commission, and it was attached to a House bill being pushed by now-Speaker Nancy Pelosi and others to acquire land in San Mateo County for the GGNRA. The bill passed in 2005, but when it did, the rider resurrecting the commission was gone. What happened? Meyer said she and other people went to Congresswomen Pelosi (at left) and Woolsey and asked that they drop the advisory-commission legislation. They feared, Meyer explained, that the Bush Administration would pack the advisory commission with people who share his ideology. “Having no advisory commission is better than having a bad one,” Meyer added. “Gale Norton [who resigned last March] was a terrible Secretary of the Interior. No one wants to bring the commission back until ‘W’ is out of office. 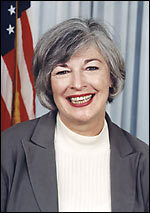 Former Commissioner Meyer isn’t necessarily against Neubacher’s plan to eliminate non-indigenous deer, but she said that in deciding what to do about the deer, or a ranger’s 2004 pepper-spraying scandal, or other matters, the commissioners could have been — as they once were — a crucial interface between the public and the Park Service. The local citizens advisory commission to the national parks was not the only one that has not been reauthorized despite the fact that “to make a park responsible to the people is very important,” she added. “It’s happening all over…. We have an administration that doesn’t believe in participatory democracy. In short, thanks to the power struggle in Washington, residents of West Marin and the rest of the Bay Area must remain frustrated for two more years. • When rangers run amok (e.g. extensively pepper-spraying innocent people who not surprisingly sue the Park Service and collect $50,000). • When the National Seashore decides there’s money to be saved by slaughtering majestic deer that have long been a part of Point Reyes and are beloved by much of the public. Ironically, settling with the pepper-spray victims cost the Park Service far more than a year’s culling once did. • When environmentally responsible mariculture is treated like a pariah. Better days no doubt are coming to Point Reyes. 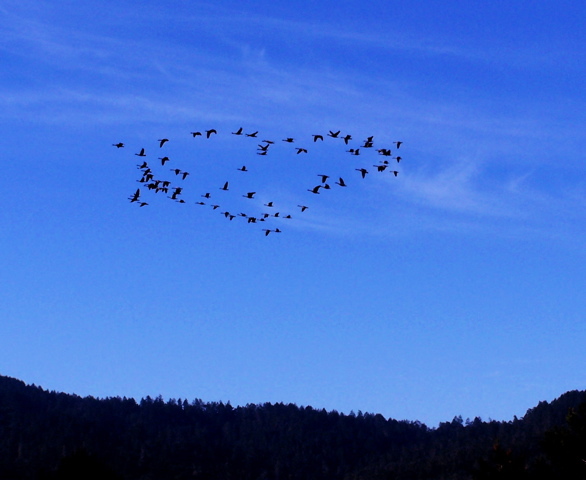 In the meantime, here’s a Valentine’s Day heart from SparselySageAndTimely.com and a flock of Canada geese between my cabin and Inverness Ridge. Sparsely Sage and Timely is powered by	WordPress 4.9.10 and delivered to you in 0.352 seconds using 50 queries.